Digiwebart is a certified Magento 2 development company focused to deliver maximum growth with experienced Magento 2 Developers & solutions experts. Magento 2 developer, custom Magento 2 Extension Developer & custom theme design. Design, Develop, support & maintenance of Magento and eCommerce websites, custom shopping cart solutions. Custom Magento 2 development agency with expert Magento 2Developer from USA, UK, AU and India. Magento 2 eCommerce. Magento 2 eCommerce Development. Ready to expand your business to an ecommerce website? 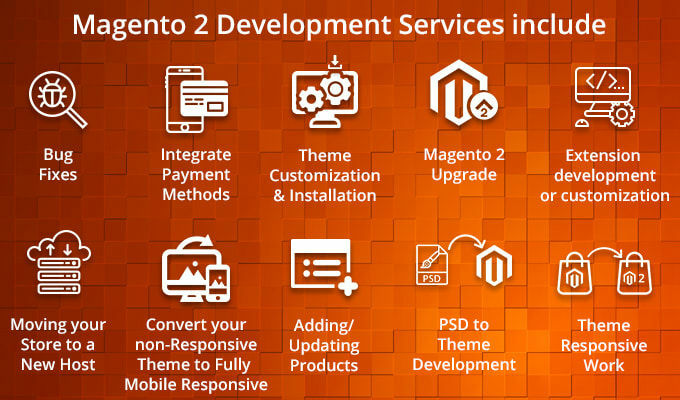 Hire a Magento 2 developer to convert your idea into reality. If you an ecommerce business, then you need to understand what a magento developer means. Magento offers an ecommerce platform for your retail business that has extensive features and scalable platform. You need to hire certified magento developer for getting an ecommerce platform that can capture the audience and give your business a big boost. Digiwebart is the best magento development company in India that has a team of skilled developers. When you work with us, you hire dedicated magento developer to transform your ecommerce site into a money churning machine. We hire magento developer India with high skills to develop a suitable site for your business. You may plan to hire magento developer USA, but hire magento programmer as the magento India pricing is very less. Therefore, you get the best service within your budget that will give you more returns. Recommended by Global Clients as India’s Best Magento 2 Service Provider! Do not wait anymore! simply call us on +91 7976779760 or email at info@digiwebart.com or Contact Us to know more about Magento 2 eCommerce development services. You can also contact us by submitting the Quick Enquiry form to know more about the magento 2 theme, module and extension development.